The lands held by the Sons of Fëanor before the Dagor Bragollach. The seven Noldorin Elves who took the Oath of Fëanor with their father, and pursued it after his death in the Dagor-nuin-Giliath. 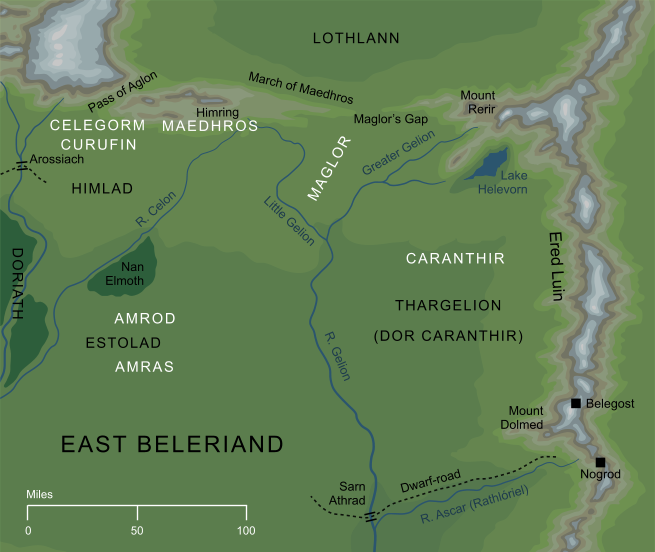 They held lands in East Beleriand, with Maedhros and Maglor holding the immediate passes south of Lothlann, and the other brothers ruling lands behind their guard to the south. Fëanor's sons were in general allied with the other Elves of Beleriand against the power of Morgoth. After the recovery of one of the Great Jewels by Beren and Lúthien, however, the Oath of their father came into action, and they fell upon the other Elves in hope of retrieving the Silmaril. They attacked Dior in Doriath, and the Exiles at the Mouths of Sirion, but neither of these forays gained them the Jewel; it was borne into the West by Eärendil. At the time of the War of Wrath, only two of the seven sons remained; Maedhros and Maglor. They stole the last two Silmarils from the camp of Eönwë, but their evil deeds in recovering them meant that the hallowed Jewels rejected their claimants. Maedhros in anguish threw himself into a fiery fissure, and Maglor in despair cast his Jewel into the Great Sea. Soon after coming to Beleriand, Maedhros was captured by Morgoth, and lost his right hand on Thangorodrim. After his rescue by Fingon, he built a stronghold on the Hill of Himring, from which he guarded the eastern marches of Beleriand. In the later First Age, he attempted to reconcile the Elves in the Union of Maedhros, but his attempts to overcome Morgoth ended in the disaster of the Nirnaeth Arnoediad. Nonetheless, Maedhros survived to see Morgoth's destruction in the War of Wrath, and finally fulfilled his father's Oath to recover a Silmaril. His evil acts in pursuit of that Oath, though, caused the hallowed Jewel to reject him, burning his hand when he held it.  In despair, he threw himself into a fissure in the Earth. Famed as a great poet and singer, Maglor also settled the lands to the northeast of Beleriand, in the region that became known as Maglor's Gap. After being routed in the Dagor Bragollach, he sheltered with Maedhros on Himring. He continued to fight to uphold his father's Oath, and after the War of Wrath he also took a Silmaril from Morgoth's Iron Crown, but like Maedhros he was rejected by the Jewel, and he cast it into the Sea. He was said to wander the shores of Middle-earth, mourning the lost Silmaril in despair, and was the only one of Fëanor's sons to survive into the Second Age. He spent the years after the Dagor-nuin-Giliath with his brother Curufin in the land of Himlad to the southwest of Himring. The two brothers held that land until the Dagor Bragollach, when they were forced to flee into the south. Coming eventually to Nargothrond, they usurped its throne and imprisoned Lúthien for a time, but were eventually ousted by the Elves of Nargothrond. Celegorm died in the assault on Menegroth, in which the brothers tried in vain to recover a Silmaril from Dior Eluchíl. The most tempestuous of Fëanor's sons, Caranthir occupied a tract of land between Gelion and the Blue Mountains, and gave it the name Dor Caranthir, 'Land of Caranthir'. He made his capital beside Lake Helevorn in the north of those mountains, and was the first of the Noldor to discover the Dwarves. He was driven out of his land in the Dagor Bragollach, and later slain in the attack on Doriath with his brothers Celegorm and Curufin. The constant companion of his elder brother Celegorm, Curufin also dwelt in Himlad throughout most of his time in Beleriand, and later came to Nargothrond. When Curufin was eventually cast out of Nargothrond, his son Celebrimbor elected to remain behind, and so escaped his father's fate in the attack on Menegroth. With his twin brother and companion Amras, Amrod was a hunter in the plains of East Beleriand. Like the other sons of Fëanor, he was driven by his father's Oath, though neither he nor Amras played as great a part in history as their five elder brothers. They survived the attack on Menegroth in which Celegorm, Caranthir and Curufin fell, but when the four remaining brothers attacked the settlement at the Mouths of Sirion, Amrod and Amras were both slain. The twin and comrade of Amrod, who hunted the lands of East Beleriand. The twins sheltered Caranthir after he fled his land to the east, and later took part in their brothers' ill-fated assault on Menegroth. Both survived that attack, but were later killed in the attempt to recover a Silmaril from the refugees at the Mouths of Sirion.